Background: The aim of the research is to study of the formation of uteroplacental blood flow in threaten miscarriage at 11-13 weeks og gestation term among patients with a normal level of progesterone in the blood and in patients with hypoprogesteronaemia. Materials and methods: The study included two groups of primigravidas patients of gestation term from 11 to 13 weeks. The 1st Group – women with pregnancy at the background of threatened pregnancy interruption (n=84), the 2nd Group – women with uncomplicated pregnancy (n=47). In both groups the definition of progesterone level in blood was performed. Based on the obtained data, the 1st group was divided into two subgroups: 1st A subgroup - with low level of progesterone in blood (n=31); the 1st B subgroup - with normal level of progesterone (n=53). Uteroplacental blood flow investigation via improved dynamic flow mode (Advanced Dynamic Flow) was provided for all the patients, that helped to assess the state of blood flow of uterine and spiral arteries. 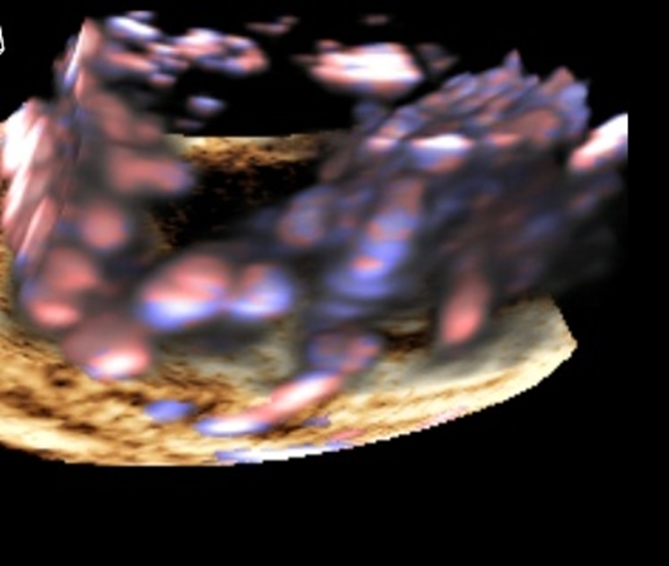 Construction of three-dimensional image of the vessels’ architectonics was carried out using the 3D ultrasound. Results: In the group of patients with deficiency of progesterone in blood, a significant increase in the value of the pulsation index of spiral arteries (p=0.0001) was noticed. A negative correlation between the level of progesterone in blood and the characteristics of the blood flow of spiral arteries was detected. Conclusion: Deficiency of progesterone in the blood of pregnant women can prevent the formation of an adequate system of “mother-placenta-fetus”. Violation of the blood flow in the spiral arteries may be considered as the main feature of Doppler sign for threatened miscarriage and possible complications of gestational process at a later terms. One of the major factors responsible for the physiological pregnancy and normal development of the fetus, is the formation of an adequate system of mother-placenta-fetus [1,2]. Primary embryonic circulatory system is formed in the early stages of gestation, during this period there is an intense vascularization of the future placental villous tree . During the formation of the placenta-mother-fetus sytem the spiral arteries play a major role . When promoting trophoblast into the walls of spiral arteries, musculo-elastic components of vessels are lysed, gaps are widen, the outfalls are formed. Gestational restructuring of the spiral arteries is most pronounced during periods of invasive activity of trophoblast: 1st wave (6-8 weeks) and the 2nd wave (16-18 weeks). Consistent and timely transformation of the spiral arteries allows the formation of an adequate uteroplacental blood flow . The period of 11-13 weeks of pregnancy is considered to be transient, as characterized by the completion of embryogenesis and early fetal development period as well as the completion of the first wave of trophoblast invasion [3,4]. Abnormal placentation is due to lack of trophoblastic "congestion" in the narrow gaps of most spiral arteries, as a result of reducing the invasion of trophoblast . It defines premature maternal blood flow and increasing concentration of oxygen in the intervillous placental space, that in the early stages of pregnancy affects vulnerable chorionic tree, causing the development of retroplacentar and/or subchorionic hematoma, spontaneous abortions [6,7]. Sufficient level of progesterone is a key factor in ensuring an adequate process of implantation of the ovum and the development of normal pregnancy . Even before fertilization, progesterone causes decidual transformation of the endometrium and prepares it for implantation, promotes growth and development of the myometrium, its vascularization, supports the myometrium at rest by neutralizing the action of oxytocin, reducing prostaglandins synthesis. Progesterone improves the conditions of trophoblast migration in early pregnancy by stimulating the growth and remodeling of the spiral arteries by inhibiting the contractile activity of the myometrium . The aim of our research is to study the formation of uteroplacental blood flow with the threatened of termination of pregnancy in 11-13 weeks with a normal level of progesterone in the blood and with hypoprogesteronaemia. Primigravidas patients [n=131] with gestational term at 11-13 weeks, aged 18-28 years (23,9 ± 3,5 years) were thoroughly examined. The study included patients with spontaneous singleton pregnancies. During the survey all possible vaginal infections, congenital anomalies, ovarian and adrenal hyperandrogenism, thyroid dysfunction, extragenital pathology, multiple pregnancy, and pregnancy, which came as a result of assisted reproduction technology were excluded. Determination of gestational term was carried out by the date of the last menstrual period. All patients were divided into two groups: 1st group - patients (n=84) with the threatened abortion. 2nd group - patients (n=47) with normal pregnancy. Patients of both groups were informed about the purpose and methods of the study and gave their written consent to their inclusion in the scientific research. All patients were thoroughly examined: detailed history taking, obstetric-gynecological examination. In the study of age, medical history, somatic health and social characteristics of women of the compared groups no significant differences were noticed. The threatened interruption of pregnancy had been diagnosed with a help of medical history and instrumental methods of research. On admission to hospital the patients of the 1st group complained of dragging pain or discomfort in the abdomen in 75% (n=63). 25% of pregnant women (n=21) had bleeding from the genital tract of varying intensity. According to the ultrasound investigation, increasing tonus of myometrium was detected in 78% of cases (n=65), with the chorion detachment with formation of retrochorial hematoma - was detected in 12% (n=11), short cervix of less than 3.5 cm - in 10% (n=8 ). 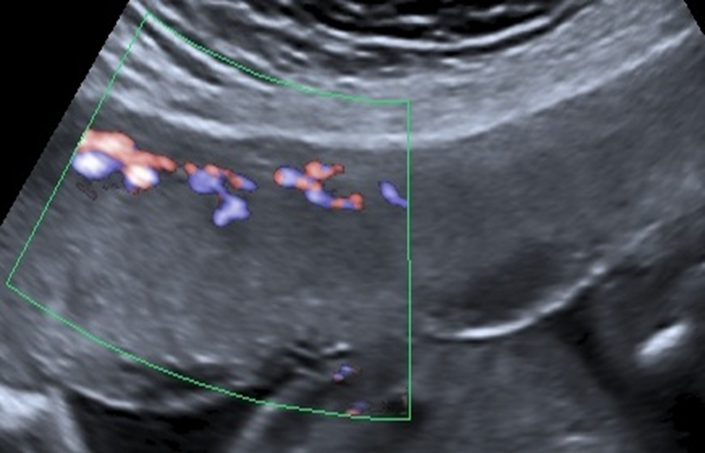 To assess the utero-placental blood flow was performed transvaginal ultrasound with Doppler, three-dimensional image in real-time using the ultrasound system Aplio™ 500 from Toshiba. With dopplerometric techniques, and the use of improved dynamic flow regime (Advanced Dynamic Flow) conducted a study of spiral artery blood flow. For the control of blood flow indices were studied in the uterine arteries. Assess peripheral vascular resistance index by calculating the Pulsation Index (PI). 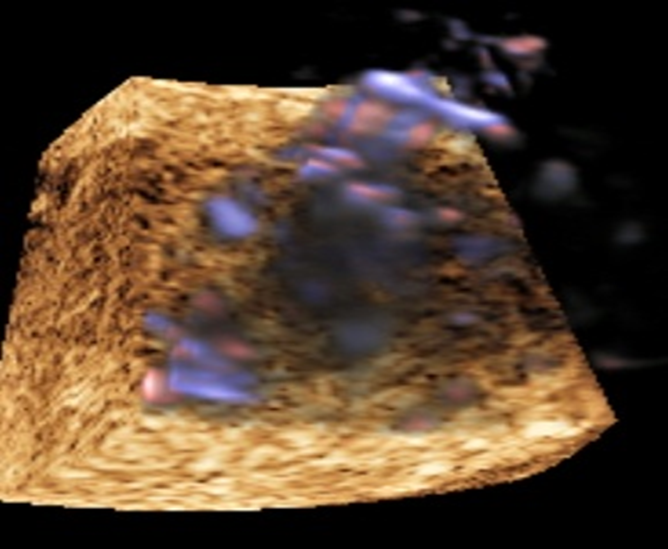 Three-dimensional sonography was performed in order to obtain three-dimensional image and study architectonic vessels. All patients were conducted determination of progesterone levels in the blood twice in the morning using the DRG Instruments GmbH company reagent kits, Germany. Indicators of progesterone were distributed according to the percentile values as follows: normal values - from 25th to 75th percentile, higher - over 75th, low - less than the 25th (Table 1). Table 1. Percentile indexes of progesterone. Based on the I-th data group was divided into two subgroups: I A - c low levels of progesterone in the blood of less than 25th percentile (n=31); I In - c normal levels of progesterone (from 25th to 75th percentile) and high (more than the 75th percentile) (n=53). Statistical analysis was carried out with a help of the computer program Microsoft Excel 2012 and STATISTICA. Test hypotheses about the equality of the two averages were performed using Student's t-test. The critical level of reliability of statistical null hypothesis (absence of significant differences or factor influences) was taken to be 0.05. The coefficient of Spearman rank correlation (rs) was determined. The nature of the relationship attributes evaluated: rs <0,1 - bond is absent; 0,1 < rs <0,3 - weak level of communication; 0,3 < rs <0,6 - moderate degree of communication; 0,6 < rs <1,0 - a strong degree of connection. When assessing blood progesterone (Table 2), a statistically significant reduction in pregnancy rates I-st group in relation to the performance II-nd group (p<0.0001) was revealed. Moreover, in the subgroup with low progesterone average was: 45.16 ± 2.5, and in a subgroup of a "normal" level progesterona- 72,27 ± 2,7 (p<0.0001), which, however, turned out significantly lower progesterone levels in pregnant women with indicators of physiological gestation (p<0.0001). Table 2. Progesterone level in patients’ blood. Notes: Statistical analyses were conducted with Student’s t-test. The data are presented as mean ±SD. **subgroup IA vs. subgroup IB. Abbreviations: SD, standard deviation; n, total number of participants in each group, subgroup. In the study of blood flow in the uterine arteries (Table 3, Figures 1-4) no significant differences between the patients of the 1st and 2nd groups was revealed. Further study of blood flow in the uterine arteries revealed no significant differences between the indices PI in pregnant women with threatened abortion in the background gipoprogesteronemii compared with those in women with normal blood levels of progesterone. In the study of blood flow in the spiral arteries it was revealed that PI in group 1 was significantly higher compared with the control group (p<0,001). Figure 1 11-13 weeks of pregnancy. ADF mode. Spiral arteries. Group with a deficit of progesterone level in blood. Figure 2 11-13 weeks of pregnancy. ADF mode. Spiral arteries. Group with a normal level of progesterone in blood. Figure 3. 11-13 weeks of pregnancy. 3D reconstruction. Spiral arteries. Group with a deficit of progesterone level in blood. Figure 4. 11-13 weeks of pregnancy. Spiral arteries. Group with a normal level of progesterone in blood. Table 3. Indicators of the Doppler study. Abbreviations: SD, standard deviation; n, total number of participants in each group, subgroup; PI, pulsatility index. In the next phase of the study a correlation analysis between indicators of progesterone levels in the blood and parameters of the utero-placental blood flow was conducted (Table 4). There is a clear inverse relationship between the level of progesterone in the blood and blood characteristics of the spiral arteries (Table 4). So, the higher the level of progesterone in the blood, the lower the level of vascular resistance spiral arteries. It is necessary to pay a special attention to such a relationship, as the spiral arteries play a key role in the formation of an adequate system "mother-placenta-fetus" that may, according to the literature, may lead to late gestational complications. Correlation analysis showed no relationship between the level of progesterone in the blood and parameters of uterine artery blood flow, therefore the analysis of the curves of blood flow in the uterine arteries will not reliably diagnose pregnancy threat of discontinuity and predict perinatal outcomes in later pregnancy. Table 4. The Spearman’s rank correlation coefficients (p-value) between progesterone level and the parameters of uteroplacental blood flow (n=131). Progesterone provides the physiological development of pregnancy. Progesterone deficiency affects the violation of uteroplacental blood flow formation. Thus, the lower the level of progesterone in blood, the higher the vascular resistance of spiral arteries. The pathological state of blood flow in spiral arteries is a manifestation of primary placental insufficiency, which leads to different complications during pregnancy. In early terms of pregnancy, uterine arteries’ blood flow indices are not informative. Correlation analysis showed no relationship between the level of progesterone in blood and parameters of blood flow in uterine arteries. Uterine arteries differ from spiral by number of anatomical and physiological characteristics, that makes them unsusceptible to the action of progesterone. Deficiency of progesterone in the blood of pregnant women can prevent the formation of an adequate system of “mother-placenta-fetus”. Violation of the blood flow in the spiral arteries may be considered as the main feature of Doppler threatening miscarriage and possible complications of gestational process at a later date. 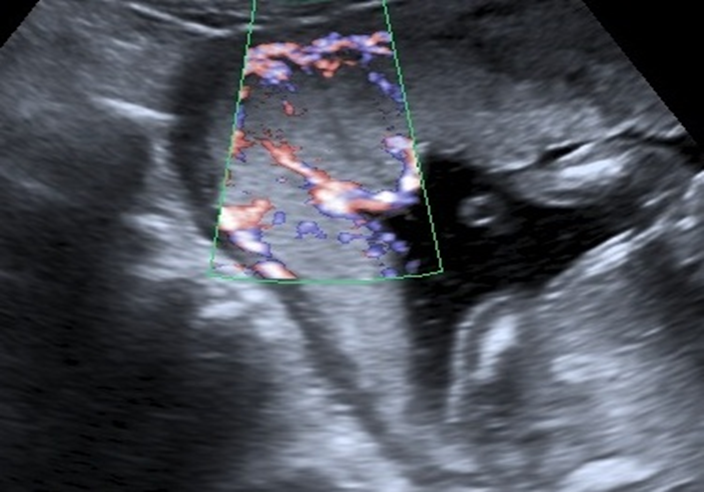 The introduction of new technologies such as three-dimensional scanning, combined with Doppler ultrasound diagnosis enhances and facilitates the early detection of disturbances in the normal development of the complex, "mother-placenta-fetus". The views expressed in this article are our own and are not an official position of the University. We did not use any sources of financial support for this study. Sidelnikov VM, Sukhikh GT (2011) Miscarriage: A Guide. M. MIA, 536. Saveleva GM, Panina OB, Kurtser MA, Gnetetskaya VA, Bucherenko EJ, et al. (2010) Prenatal period: physiology and pathology. Russian Gazette of obstetrician-gynecologist 61-65. Milovanov AP, Kirichenko AK (2009) Cytotrophoblast invasion - a key mechanism for the development of normal and complicated pregnancies. Krasnoyarsk. Formation and placental pathology. edn Prof. Krasnopolsky VI, Moscow, "Medicine"- 2007, 112. Pijnenborg R, Brosens I, Romero R (2010) Placental bed disorders. Basic science and its translation to obstetrics. Cambridge: Cambridge University Press; 320. Aleksandrova NV, Baev OR (2011) The early stages of the system mother-placenta-fetus. Obstetrics and Gynecology: 4-10. Threatened abortion in different periods of gestation. Tactics and strategy of modern therapy. Edited by prof. Dobrokhotova JE - Moscow, RNRMU named after Pirogov NI, 2013. Dobrohotova JE, Zalesskaya SA, Van AV, Kulikova AS (2014) Modern tocolytic therapy in complex treatment of threatened preterm delivery (literature review). Gynecology 4: 68-71. Burton GI, Charnock-Jones DS, Jauniaux E (2009) Regulation of vascular growth and function in the human placenta. Reproduction 138: 895-902. ©2016 Dobrokhotova JE. This is an open-access article distributed under the terms of the Creative Commons Attribution License, which permits unrestricted use, distribution, and reproduction in any medium, provided the original author and source are credited.